During the past year some very interesting experimental results have been obtained in the fields of immunochemistry and serological genetics with the aid of the grant of $19,000 made by the Rockefeller Foundation to the California Institute of Technology. The investigations carried out in the Division of Chemistry and Chemical Engineering have dealt mainly with the problem of the nature of the antibody molecule, with consideration also of the more general problem of the structure of proteins. The experimental results are beginning to provide a strikingly detailed picture of the structure of antibodies in the neighborhood of the combining regions. A report describing this work is submitted with this letter. In the Division of Biology researches in serological genetics have been carried on, under the direction of Professor A. H. Sturtevant, by Professors Albert Tyler and Sterling Emerson. The results which they have obtained, described in some detail in the accompanying report, deal with univalent antibodies, auto-bodies, natural hetero-antibodies, the specific interacting substances of eggs and sperm in relation to problems of fertilization and infection, and the serological induction of mutations. The experiments carried out by Professor Emerson on the serological induction of mutations in Neurospora are especially interesting; he has obtained evidence that specific antisera cause mutations to occur in the mold Neurospora. This is such an interesting and fundamental point that it is very important that extensive work be carried out, leading to a completely convincing answer to the question. The work in immunochemistry and serological generics is in my opinion very closely connected with the great problem of the structure of proteins in general, and I think that the fields of research can contribute significantly to the solution of this great problem. At present only a small amount of research in pure science is still being carried out in the laboratories of the California Institute of Technology, because the facilities of these laboratories are largely being used for war research. I anticipate that the facilities of the laboratories will continue to be used for war work during all or most of the year 1945-1946. It will be possible, however, to continue work in immunochemistry and serological genetics on approximately the same scale as at present, and because these fields of research have shown themselves to be very fertile, I would like to see this work continued for another year. 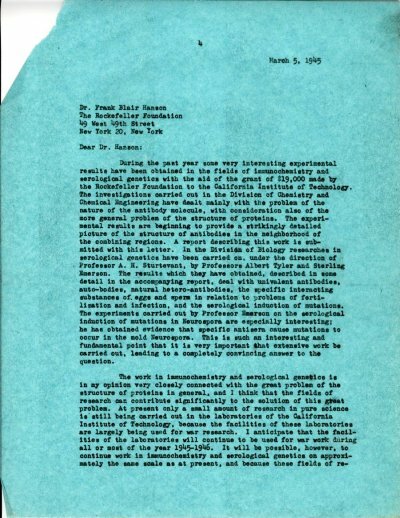 I am accordingly, with the approval of the Administration of the California Institute of Technology, applying to the Rockefeller Foundation for a grant of $19,000 for the period July 1, 1945 to June 30, 1946, for the support of researches in immunochemistry and serological genetics under the supervision of Professor A. H. Sturtevant and myself. A budget is presented on the following page. I would like to mention again that the work carried on in recent years with the support of earlier grants from the Rockefeller Foundation has had the sponsorship of Dr. A. N. Richards, Chairman of the Committee on Medical Research, who three years ago expressed the opinion that this work would be useful to the Nation in war time. This opinion has been to some extent justified by the developments that have occurred during the past three years. The workers in immunochemistry have devoted part of their time to war problems, with the support of a grant from the Committee on Medical Research. This has led to the development of a material, Oxypolygelatin, which promises to be of value as a plasma substitute. In addition another war problem, of interest to the National Defense Research Committee, has been solved by the men working on the immunochemistry project.